Vazania, as they are called in the Cypriot dialect, (in Greece they are called melitzanes), is a simple dish made withe fried eggplants and potatoes, which are cooked, together in a tomato sauce, with garlic and onions, to make them “giahni” (stewed). This vegan dish, uses only a few humble ingredients, so it’s not only frugal but also very delicious. 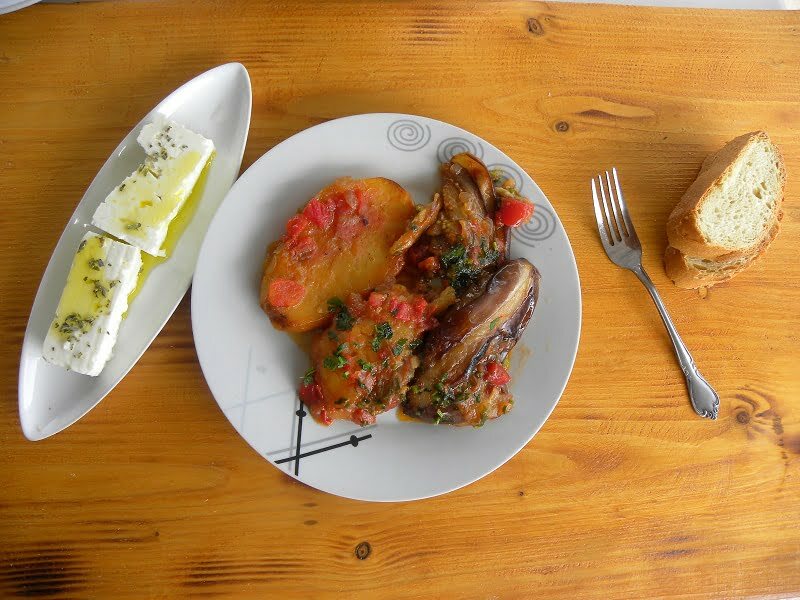 Giahni, also called “ladera”, meaning cooked in olive oil dishes, are usually accompanied by feta and lots of crusty bread to mop up that delicious sauce. My mother, as well as all other Cypriot women, would fry the potatoes and eggplants in a lot of oil and they would then sauté the onion in the oil and add fresh ripe tomatoes and tomato paste, as well as all the other ingredients, in the frying pan to make the sauce, which they would then pour this sauce on top of the potatoes and eggplants to cook them on the stove top. That was so delicious but too oily and fattening so I have modified this recipe from the original Cypriot recipe, in order to make it healthier and lighter. The eggplants I used are called “Tsakonikes” in Greek and they are named after the area in Peloponnese where they are produced. I love these eggplants as they are not bitter and therefore they do not have to be soaked in water with salt to remove the bitterness. However, any variety of eggplants can be used. As I did not know what this type is called in English, I google searched it and they look like the Japanese Eggplants, but as I’ve never tried the Japanese I cannot be sure if they are the same ones. When I had a cooking class with a Japanese lady, we were making “moussakas“, using the same eggplants. When I asked her if these are Japanese eggplants, she says that these eggplants to not exist in Japan! Eggplants are seasonal and cost about 1 Euro a kilo, potatoes cost around 0.65 to 0.70 cents a kilo, ripe tomatoes cost around 0,60 cents, and adding up the cost of olive oil, this light and very tasty dish does not cost more than five Euros. Considering that this light and tasty dish definitely costs less than 10 dollars, even if we add the cost of feta and bread, I am submitting this recipe to Frugal Fridays, created by Jerry and co-hosted by Ben, of What’s Cooking. Greek eggplants and new varieties in general, are not bitter, but depending on the variety you will be using, you may need to remove the bitterness first. Cut off the stalk, cut them into slices, sprinkle liberally with salt and leave them for 20 minutes to remove much of the bitterness and draw out some moisture. This way they will not absorb a lot of oil when fried. Wash to remove the salt and drain on kitchen paper before cooking. Wash the eggplants and set aside to drain. Do not peel them yet as they will oxidize, unless you put them in water. Peel and wash the potatoes and cut them into 1 cm slices. In a food processor puree the tomatoes with the tomato paste. Heat ½ the olive oil in a sautéing pan and sauté the potatoes on both sides until lightly browned. While the potatoes are being sautéed, remove their stalks and cut them into 2 or 3 slices, make a slit and put a piece of garlic in each. Remove potatoes and add 2 tbsp oil and sauté the eggplants on both sides. Remove the eggplants, add the remaining oil and sauté the onion until translucent. Add the tomatoes, water, salt, pepper and parsley and mix. Put the eggplants and potatoes in a pot and pour the sauce on top. Bring to boil, lower heat and simmer until potatoes are soft and the sauce is thick. Serve with feta and crunchy bread. Vazania, is the name of eggplants in the Cypriot dialect, (in Greece they are called melitzanes), which are fried together with potatoes and stewed, to make them giahni, which is a delicious vegan and frugal dish. Wash the eggplants and set aside to dry. Do not peel yet as they will brown unless you put them in water. Peel and wash the potatoes and cut them into 1 cm slices. In a food processor puree the tomatoes with tomato paste. Heat ½ the olive oil in a sautéing pan and sauté potatoes on both sides until lightly browned. While potatoes are being sautéed, cut the eggplants in 2 or 3 slices, make a slit and put a piece of garlic in each. Remove potatoes and add 2 tbsp oil and sauté the eggplants on both sides. Remove the eggplants, add the remaining oil and sauté the onion until translucent. Add the tomatoes, water, salt and pepper and parsley and mix. Put the eggplants and potatoes back in the sauce and bring to boil. Lower heat and simmer until potatoes are soft and the sauce is thick. Serve with feta and crunchy bread. Any variety of eggplants can be used. As the proverb says, a picture is worth a thousand words! This and many more recipes are included in my cookbook Mint, Cinnamon & Blossom Water, Flavours of Cyprus, Kopiaste or on Volume 1 of the digital cookbook. You can also find more Greek recipes in my cookbook «More Than A Greek Salad». Both cookbooks are available on all Amazon stores. Read more here. This is one of my all time favourite dishes Ivy. I like the “healthy” version you posted too. A friend of mine does something similar except he grills the eggplants and potatoes. You def need lots of bread for this one! Axx Ivy, these dishes are superior in Greece because of the better produce over there. How else to explain these dishes tasting so good even at room temp? Good to see you wiping the plate. That sounds so aromatic and delicious! Peter, I do that (grilling) for moussakas but here you will need some oil anyway to make the sauce, so instead of making sauce with oil, I take advantage of the little amount absorbed by the eggplants, for the sauce to thicken. Peter M, we are really blessed to have such good produce because that is what gives the final result. Those hairy hands are my sons’. Guess what? I love eggplant. It looks really, really good. I can’t believe how much you cook! I can’t keep up. I love your healthy dish 🙂 will bookmark this to try ! Emiline, see these tags: family, hungry, five, three men. That says it all (lol). Vani, I would certainly like to make it with Indian spices. What should I use? This is a lovely version of an aubergine dish..aubergines are one of my favorite veggies..You can make so many dishes with them.. If you have a recipe or a link you can send me, maybe I must try the Indian version. There’s a middle eastern restaurant near me that makes an eggplant and tomato sauce appetizer/side – it’s like heaven. I’m so happy to see recipe for something that looks quite similar. Absolutely delicious. I lurv eggplant Ivy – this looks like a great way to serve it. The aubergines you used were the long ones? In my country, we have several types of round, long and slender and of course Japanese eggplant called Nasu. Nasu is very small about 6-7 inches in length compared to the slender ones which could reach 12-18 inches long. Japanese are peculiar, cos if their vegetable is like that they always maintain the same size and color. Round ones about the size or slightly bigger then tennis balls and in several colours from light green, cream to pruple zebra species. The less common in my country is the European Aubergine with dark purple skin and looks like giant purple pear! Sounds like a lovely dish. I rarely cook with eggplant, but I have come across some very tempting dishes lately, including this one. Thanks for the recipe, I really liked. I love eggplant.